Anthony Gaines drives to the basket. The sophomore guard played big minutes Tuesday. 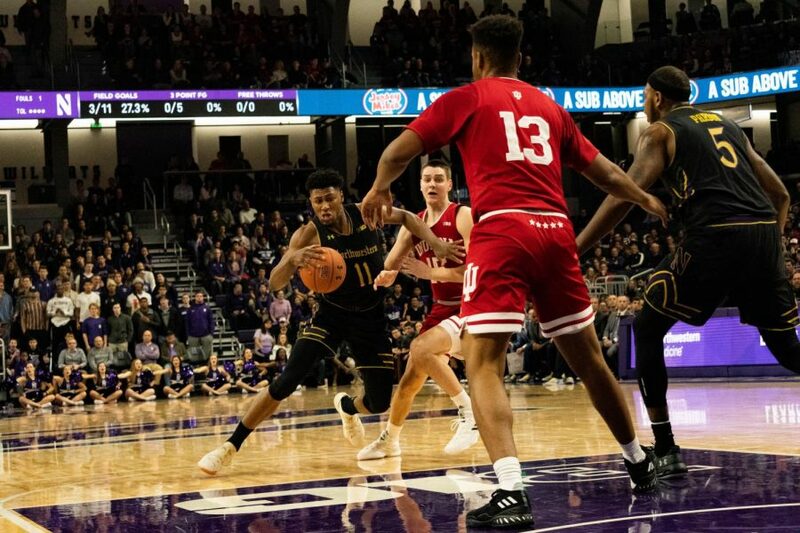 There was no shortage of noteworthy storylines in Tuesday’s matchup between Northwestern and Indiana. On a snowy night in Evanston, coach Chris Collins picked up his 100th career win; senior center Dererk Pardon scored his 1,000th career point; redshirt junior forward Aaron Falzon — yes, Aaron Falzon — hit six 3-pointers and dropped 21 points; and the Wildcats (12-7, 3-5 Big Ten) claimed their third conference victory of the season in a 73-66 win over the Hoosiers. For the fourth game in a row, the Cats got down by five-plus points in the game’s opening minutes, shooting 2-for-8 from field goal range and letting Indiana build an eight-point lead. After an eight-possession-long scoreless stretch from both sides, Falzon came off the bench and hit two back-to-back 3-pointers to cut the Hoosiers’ lead to one with less than five minutes to play in the first half. Falzon drained another three to put NU up by two late in the first, and the Cats took a 28-24 lead into halftime. The forward hit three more huge shots from deep in the second half, and NU built a 15-point lead. Indiana launched a comeback late, going on a 7-0 run, but the Cats managed to hold on and walk away with the win. Pardon finished with 17 points and five rebounds, while redshirt junior forward A.J. Turner and Anthony Gaines added six assists each. Forward Juwan Morgan scored a team-high 18 points for the Hoosiers. 1. Aaron Falzon had himself a night. The redshirt junior forward has had a turbulent career for NU. The Massachusetts native set multiple program records in 29 starts as a freshman during the 2015-16 season, but he sat out the entire next season with injuries, and his production dropped when he returned for the 2017-18 campaign. Tuesday was just the fourth appearance he’s made this season — all six of his points came against Chicago State — but he made it count, draining six 3-pointers and finishing with a career-best 21 points. 2. NU had one of its better defensive performances of the season. All-Big Ten favorite Romeo Langford entered Tuesday’s matchup averaging 17.9 points per game, and had scored 20 — including the game-winning floater — when the two teams last met in December Against the Cats’ defense, the freshman phenom managed only 12 points, tied for the second-least he’s scored this season. NU blocked eight shots and forced Indiana to turn the ball over 12 times. While the Hoosiers threatened late in the second half, the Cats managed to get to the free-throw line and keep the game in their hands. 3. The Cats’ postseason hopes aren’t gone yet. Both teams needed this win. Indiana, having just dropped out of the Top 25, entered the game on a four-game losing streak and needed a confidence-booster before it faces both No. 5 Michigan and No. 6 Michigan State in the next 12 days. NU came into the matchup sitting just four places from the bottom in the Big Ten and looking to win two conference games back-to-back for the first time since January 2018. The Cats were able to overcome the Hoosiers and their vocal away support for some much-needed momentum ahead of Saturday’s trip up north to face Wisconsin.